'CUNALEGEA MAQI C...SALAR CELI AVI QUECI'. 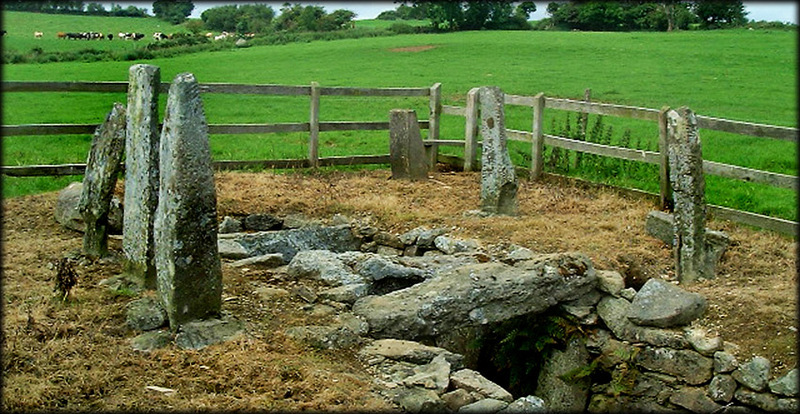 In 1867 a farmer discovered a souterrain, an artificial cave, in one of his fields, he discovered that ogham stones were built into the walls and roof of the souterrain and in 1936 part of the cave was dismantled and some of the ogham stones re-erected above ground. The picture above shows the souterrain and three of the standing ogham stones.This is a really wonderful site and I would strongly recommend a visit. The stone on the right bears the insciption 'MANU MAGUNO GATI MOCOI MACORBO'. The stone pictured left reads 'CALUNOVIC MAQI MUCOI LIT......'. Situated: From Kilmacthomas, Co Waterford, take the N25 west, at the first crossroads take a left for Stradbally at the second crossroads take a right then the next right, about 300 metres down this road you will come to a gate with a house next to it. Go through this gate and follow the path the stones are about 200 metres down this path in a field on your left hand side. Discovery Map 75. S 3658 0139.